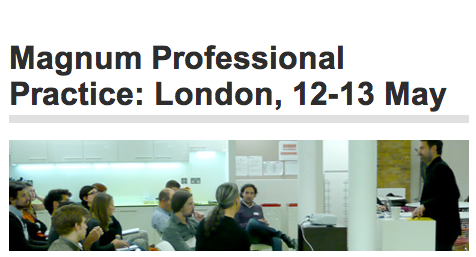 I am spending two days at Central St Martins attending a two day workshop on Professional Practice with Magnum. So far we have heard from Sophie Wright– Cultural Director, Magnum Photos, Fiona Rogers – Cultural & Education Manager, Magnum Photos, Kate Pattison – Head of Stories – Film & Photography, Oxfam and Stuart Smith – Smith Design. It was a long day with lots of information presented. The award for making the group laugh the most would go to Stuart Smith (if there was an award) whose presentation was interesting and informative throughout. All the speakers had interesting things to say and brought lots of information to the group. We are hopefully getting a tour of the venue tomorrow as we are in Central St Martins new campus and it is quite a special building with lots of light and it feels like a place that lots of ideas could circulate freely within. Originated as a response to the changing nature of the photography market, Magnum’s Professional Practice events deliver impartial guidance and networking opportunities from a wide range of visual imaging industries. With access to key individuals working across the editorial, commercial, cultural and publishing visual industries, Magnum is well placed to advise the next generation of photographers on the best professional practice. In a series of weekend lectures, leading figures of the photographic industry will deliver presentations and advice on the best means in engaging with and the realities of working in their sectors. Speakers from the advertising & corporate, editorial, gallery, NGO, museum, publishing and rights managed sectors will each give presentations on their subject of expertise, with plenty of time for questions and networking opportunities. This event is aimed a wide range of photographers at different stages of their career: professional photographers working in a particular discourse but wanting to explore other avenues; emerging photographers who require practical, vocational training; or semi-professional photographers wishing to make the commitment to full time practice. Each of Magnum’s Professional Practice lectures is tailored to deliver the best impartial advice and provide the opportunity to meet with key industry specialists. Places on Magnum’s Professional Practice course are limited and successful candidates will be chosen on the perceived benefit to the applicant’s career.